I should have bought the 32 GB iPhone(s AAPL), I thought to myself as I tried to update GarageBand on my iPhone. I don’t have enough space to download the update, the dialog box tells me. For those of us that tend to fill our phones to the brim with apps and media, this is a familiar scenario. However, there’s a neat trick to make it easier to temporarily reclaim space on your iOS device. In short, simply delete music on your device until you have enough room, and then resync (wirelessly, of course) with iTunes when you don’t need the extra space anymore. All of the music you deleted will be right back where it was. 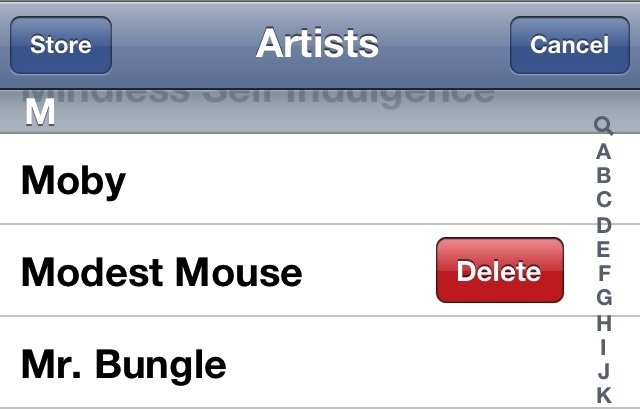 Deleting music is easy. In the Music app, you swipe across the title of an artist/song/album, then hit the delete button that appears. By deleting all the albums by Modest Mouse on my phone, I was able to save about 600 MB of space, which was enough to download the GarageBand update. A quick resync later, and my music was back. If you have any more tips on saving space in iOS, tell us about them in the comments.